We pray our goodbyes to our Sr Evelyn Marie Martinelli. She was 96 years old and lived a vibrant life. All around us we see so many young people die – in wars, earthquakes, gangs, etc. – that to live to be 96 with a lifetime of experiences and relationships is a great gift. What was this lifetime of experiences and relationships for Sr Mary Evelyn? 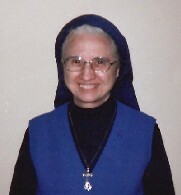 Sister was born on 29 May 1913, in Manton, R.I., after an older brother and followed by a younger sister, Sr M. Carmel. Their mother Pasqualina died young in the 1917 flu epidemic. Their father, Pasquale, remarried a few years later and the family grew to five. Once again, death struck when her step-mother died in childbirth when Evelyn was 14 years old. As the eldest, with 4 younger siblings, Evelyn became mother of the home. Lou, her half-sister, has said that Evelyn lived 2 lives – one, as the mother of a family raising 4 younger brothers and sisters until they were adults and the other, at the age of 39, entering the Marist Missionary Sisters. Sr Mary Evelyn entered 6 months after her younger sister, Sr M. Carmel, in 1952 and was professed on August 15, 1954. Her personality was outgoing and social and these combined with secretarial and business acumen put her to work in the vocation office, store at Isabella Street, first receptionist at Maristhill Nursing Home and secretarial work for the Province. Her 4 years in Hawaii, as part of the staff managing the Seminary, was also a mission influencing young vocations and earning an income for an impoverished Region which had no income- generating works in the U.S.
We thank Sr M. Evelyn for her missionary service given to SMSM in the U.S.A. I think it was a special sacrifice as she did not go far a field for mission as did her sister, Sr M. Carmel, who served in Fiji at the Leprosarium. Our Constitutions tell us that: “we are missionary for the whole of our lives, wherever we are.” I saw that Sr M. Evelyn continued her mission at the Bethany Healthcare Center where she was sent in 2005. Sr Mary Carmel had been there a few years earlier and was loved as a gentle person. This was a challenge to Evelyn to let go of her control and to allow her gentle side to take over. As I visited with her the last week of her life, many workers and St. Joseph Sisters came to tell me what a beautiful person Sister was – always gracious, grateful for the least care given and smiling. Thus her mission ended with Mary’s gentle Spirit.